Entering Space – ultimate energy resources? 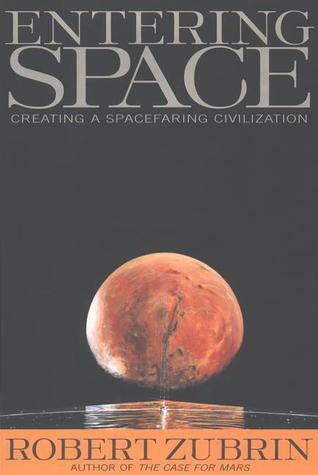 I recently read a book called ‘Entering Space: Creating a Spacefaring Civilization‘, by Robert Zubrin. I’ve been covering a lot of this literature as I think it may have a lot to tell us about how to best tackle a slew of 21st century problems in planetary resource management. Zubrin’s work examines, using an evidence-based approach, the prospects and challenges humanity will face in setting up colonies on other planets, moons and minor bodies of the solar system, and eventually, in expanding to interstellar realms. I’ll explore many of these ideas in future posts, but for now, I wanted to kick up some discussion on two tables Zubrin presents in Chapter 8, on sources of energy. First, he does a simple projection of future human energy use through to the year 2200. The presumption is that as our reliance on energy-intensive technology continues to grow, our demand will skyrocket — especially if we pursue extraterrestrial settlement and geoengineering. To glimpse the probable nature of the human condition a century hence, it is first necessary for us to look at the trends of the past. The history of humanity’s technological advance can be written as a history of ever-increasing energy utilization. If we consider the energy consumed not only in daily life but in transportation and the production of industrial and agricultural goods, then Americans in the electrified 1990s use approximately three times as much energy per capita as their predecessors of the steam and gaslight 1890s, who in turn had nearly triple the per-capita energy consumption of those of pre-industrial 1790s. Some have decried this trend as a direct threat to the world’s resources, but the fact of the matter is that such rising levels of energy consumption have historically correlated rather directly with rising living standards and, if we compare living standards and per-capita energy consumption of the advanced sector nations with those of the impoverished Third World, continue to do so today. This relationship between energy consumption and the wealth of nations will place extreme demands on our current set of available resources. In the first place, simply to raise the entire present world population to current American living standards (and in a world of global communications it is doubtful that any other arrangement will be acceptable in the long run) would require increasing global energy consumption at least ten times. However, world population is increasing, and while global industrialization is slowing this trend, it is likely that terrestrial population levels will at least triple before they stabilize. Finally, current American living standards and technology utilization are hardly likely to be the ultimate (after all, even in the late twentieth-century America, there is still plenty of poverty) and will be no more acceptable to our descendants a century hence than those of a century ago are to us. All in all, it is clear that the exponential rise in humanity’s energy utilization will continue. In 1998, humanity mustered about 14 watts of power (1 terawatt, TW, equals 1 million megawatts, MW, of power). At the current 2.6 percent rate of growth we will be using nearly 200 TW by the year 2100. 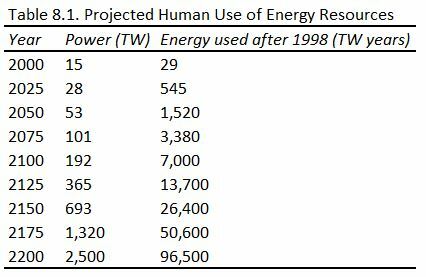 The total anticipated power utilization and the cumulative energy used (starting in 1998) is given in Table 8.1. 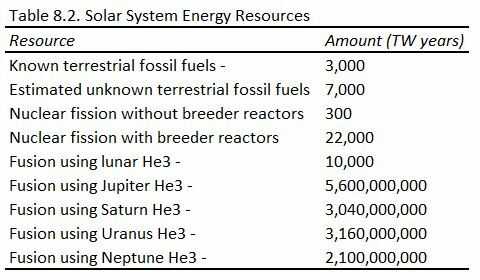 By way of comparison, the total known or estimated energy resources are given in Table 8.2. I ought to point out that I, and others, have used different assumptions about the availability of uranium in sea water and its recharge rate due to riverbed erosion, to come up with a more optimistic for nuclear fission with full fuel recycling (i.e., the possibility of supplying about 30 TW years, per year, for a billion years or more). But the main point about the massive resources and almost unlimited expansion potential available to Deuterium-He3 fusion, if we can close out this research and access the fuel, is hard to ignore. The broader question is, how constrained is our thinking in regards to ultimate energy resources? Should humanity be planning to significantly and permanently extend our reach into space now — BEFORE we manage to solve all of our myriad Earthly sustainability problems, in the hope that this will supply us with the very tools needed to deliver adequate solutions? Food for thought. NOTE: In line with the new 2014 approach to BNC, this is the first in a series of short “Aside” blog posts (1-2 a week) that are focused on single, relatively simple points, with the goal of stirring informed discussion and debate. The plan is for these Asides to be regular features of the site, with the longer and more elaborate information/education posts (written mostly by the stable of regular BNC guest posters) cropping up every once in a while (roughly 1-2 per month). I’m a bit dubious about some of the extrapolations. My understanding is the latest demographic projections have global population peaking around 2050-2080 at a level less than double the current global population, not triple. And are there not also indications that per capita energy consumption in advanced economies may be plateauing? It’s an interesting issue Mark, because it depends on so many factors — wealth, education, response to environmental change. I suspect that the median 9.5-11 billion projection for peak population by the UN is correct, based on the systematic declines in birth rates in almost all countries. This, as you point out, is less than a doubling from today. Of course, if we start to move out into space, then the population could explode — but this is will be multi-century phenomenon. Energy use in the future is even trickier, because it’s so tied to technologies, many of which we simply can’t imagine today. There are a lot of reasons we don’t currently use a lot more energy, and most of them come down to cost and availability. If we can reduce cost and impact, I suspect that we’ll find more and more uses for energy — especially in geoengineering and space travel, which is ultimately where the massive energy consumption projections that Zubrin and others are talking about come from. Thanks for the informative and enjoyable post. I, too, think that we can “walk and chew gum” at the same time–that we can simultaneously expand into space and solve our problems here on Earth. If nano-tech, robotics, and AI ever combine in advanced enough form to fire a self-replicating droid ship (or complex of ships) at the asteroid belt, one day gifts might rain down from the heavens. Those asteroids have enough water and uranium and volatiles and metals to make all sorts of goodies for us. And the Delta V may not be that prohibitive! The children per woman isn’t far above the break even point now, and it can only drop as girls get educated in the developing world, so I’d expect us undershooting most population predictions. Similarly, I don’t expect energy consumption to grow that much higher than it is already … we just have to clean it up. Large sections of the first world have worked out that stuff isn’t what makes people happy … once you have a reasonable level. The developing world will work this out also. Travel will be the big rising energy glutton for some time, and that might prove me wrong. I doubt I’ll live long enough to watch the end game but I’d be pretty distressed if we chose space exploration over ensuring that everybody is well and truly above the poverty line. As long as a kid with spina bifida can’t get a wheel chair but a person with a Branson-sized fortune can buy a personal space trip, we’ll know that we have collectively failed Introductory Ethics 101. Uranium’s cosmic abundance — as exemplified by its mass fraction in the Sun — is on the order of 0.01 ppm. Here on Earth we benefit from its history of bubbling up, over geological time, to within drilling distance of our feet (http://www.fe.infn.it/u/mantovani/CV/Paper/Fiorentini_05b.pdf ). This ~250-fold enrichment has made the continental crust as energy-rich, as fuel ore for CANDU reactors, as the tar sands are for oil burners. But water and life-produced oxygen get into the act, switching uranium between its IV and VI valence states, and producing much greater local concentrations. Result: the world’s largest tar mine and the world’s largest uranium mine are both in this satellite view (see if you can spot them) (http://goo.gl/maps/AZ7gK). The uranium mine is bigger in wattage terms, but around two orders of magnitude smaller in financial ones. Maybe other mechanisms have yielded similar concentrations in the asteroids, but as yet there is no sign of this. If the Earth turns out to be the solar system’s uranium mine, huge amounts of off-planet energy can still be obtained using gravity. Interesting and thought provoking words about the growing energy demand. I wonder about that example, Geoff. In the long term (multi-century, as Barry indicates), the kid with spina bifida could be better off in a low-g environment than an Earthbound wheelchair. GRL Cowan spot on about uranium cosmochemistry/geochemistry, by the way. Lots of highly concentrated metals up there, but uranium not likely to be one of them. The world population isn’t going to triple from present-day values. The current hordes in the fast-growing areas are sustained by food, medicine and technology from the industrialized West. However, the people who built the West are under demographic seige and replacement by the ethnies which have failed to create functional, prosperous societies in their home countries. When the West’s governments collapse under the pressure of exploding welfare rolls and non-productive (and downright criminal) populations, the aid budgets which provide the food and medicine will disappear. Starvation, rioting and collapse in the aid-dependent countries will follow within weeks. Honestly the issue, the only real issue, is that outside the troposphere, human life is impossible due to truly massive amounts of radiation and solar flares. There is no technology today that can allow for a sustained human presence beyond a million miles out. Secondly, there is no technology on a mass scale that can save us from low gravity effects on the human body save for some grand O’Neil rotating habitats. I think the economics that have to deal with just these two issues is very forbidding. I read GG&S many years ago. Diamond’s blindness (or devotion to falsehood) is laid out in plain language on page 14, paragraph 4. What he asserts is simply false to fact, and anything based on that presumption is unfounded. If you want to see the truth, just look at recent history of all of 3 years ago. Price increases of grain in the Maghreb were a major cause of the riots which became the “Arab Spring” (which did not turn out so well either). Somewhat more unrest would degrade or destroy the ability to deliver food aid at all, with mass starvation guaranteed as a consequence. Your comments are very close to violating the BNC Comments Policy (personal/racial etc comments). You are also veering off-topic. Please read the Comments policy before commenting again. Future violations may be deleted. “Eng.Poet” … you mean the bit where he says New Guineans are as smart as whites? Read John Flynn … “What is intelligence?” People who study intelligence for a living agree with Diamond and Flynn … not you. David, radiation and solar flares can be coped with by shielding and piling soil on structures (on places like the Moon and Mars). On Titan — which Zubrin argues is the most attractive extraterrestrial body in the solar system for colonisation, all the shielding (and fuel!) is already there. ‘Tis just a bit chilly. Have to say that I think Robert Zubrin is dreaming in technicolour through rose-tinted glasses and eating pie in the sky while high on something. Had we worked seriously on Gen III nuclear / renewables starting 25 years ago, things might be different. With zero Arctic sea ice coming in 3 – 5 years, we are now into abrupt climate change. Industry & government will be devoting tremendous resources to fighting storm, flood, and wildfire; food production will be struggling with flood and drought. Essentially, a coping and adapting “strategy”, very costly in $ and resources. Not much left over for the very speculative effort to establish viable colonies in space. KeenOn350, your argument might be reasonable if our society was already devoting a significant fraction of our budget to fighting climate change. But we are not — we are spending <<1%. So devoting a tiny additional fraction of global GDP to space exploration and colonisation hardly seems problematic or likely to stymie our efforts at greenhouse gas mitigation. As I noted in the post, it strikes me as a weakly justified argument that we can’t do both, now, especially given the potential synergies (space exploration will need cheap, non-fossil energy!). The 1960’s goal of putting a man on the moon excited public imagination and has held popular approval of space activity ever since. Spin-offs include a wonderful array of earth-observing robotic spacecraft. Although overwhelmingly profitable (at least in terms of disasters avoided), the robots would not have been funded were it not for the romantic dream of manned space exploration. When people dream of space-borne escape from the wreckage of our wastes, they could also dream of space-borne robots to help us clean it up. One urgently needed mission is a CO2 mapper in orbit. Identifying and measuring localised sources of emission needs a spatial resolution of less than 1 km. It would probably use narrow wavelengths in the infrared where the atmosphere is partially transparent to CO2, so that changes in transparency measure the concentration of CO2 in each column of air being scanned. A United Nations protocol on CO2 reduction would be greatly enabled by the ability to identify sinning industries and measure their emissions. As embarrassment would be shared by all major industrial nations, it might well have to be funded collectively, under the same United Nations agreement. Roger Clifton: OCO-2 (Orbiting Carbon Observatory) is scheduled for launch this summer. The original OCO satellite was lost in 2009 due to a launch vehicle failure. So a CO2 mapper, “OCO-2” is due aloft. That’s good news, Seamus! Your link goes on to say: it will carry “… three classical grating spectrometers. Each spectrometer will detect the intensity of radiation within a very specific narrow band at Near Infrared (NIR) wavelengths”. I couldn’t find the spatial resolution, but its use of gratings means that few photons will be available for hi-res mapping. My guess of 1 km2 begs for an update. Anyone? I am trying to find the source for “about 30 TW years, per year, for a billion years”. I went to the link and several others in the SNE2060 series, but can’t find where you calculated the 30 TW for a billion years. Could you please point to the link where the basis of estimate is so I can reference it. https://bravenewclimate.com/2010/10/14/2060-nuclear-scenarios-p3/#more-3342 which also has a link to Mackay’s calculations for uranium from seawater. Unfortunately, the WordPress site has some limitations as Barry has already explained. I ought to point out that I, and others, have used different assumptions about the availability of uranium in sea water and its recharge rate due to riverbed erosion, to come up with a more optimistic for nuclear fission with full fuel recycling (i.e., the possibility of supplying about 30 TW years, per year, for a billion years or more). Can Barry provide the source. Perhaps it’s not a billion but a million, but whatever it is I haven’t been able to find it. Secondly, you seem to have misunderstood the point of my suggestion. I was trying to urge Barry to consider providing a simple index for the posts as they were previously on the Renewables Limits and the Sustainable Nuclear tabs. The reason for my suggestion is to make it easier to find the past posts and to have them all well organised and so you can see them all together in one place. It is extremely time consuming to go searching in the way you suggest (when you may not recollect what to search on) or through the archives by date. I think providing the lists again would be helpful to users and make BNC more valuable. At thermal efficiencies of reactors cooled by liquid metals or molten salts, the fission of 1 ton of heavy metal per year yields roughly 1 GW of electric power. This 2007 post to sci.energy gives a figure of 35,000 tons of uranium delivered by rivers to the oceans every year (it cites a post at niof.org which is no longer available, but I traced it back to here where the number is given as 32,000 tpy and the source as Bernard Cohen. At 1 ton per GW-yr, 32,000 tpy is sufficient to supply 32 TW(e) (roughly 80 TW(th)). Thank you, that’s helpful. On that basis if we were to ever use all the economically recoverable (in the future and with future exploration and mining technologies) uranium and thorium in the Earth’s continental crust (where these elements are concentrated) the ~6×10^13 tonnes of uranium (not including thorium), then there is an effectively inexhaustible supply of uranium in the oceans. From the figures you quote from Bernard Cohen, 32 TWe can be supplied indefinitely from fission without even reducing the concentration of uranium in the oceans. Wow! I hadn’t realised that previously. By the way, you may be interested to know that ~10,000 tonnes of uranium is being concentrated in the Earth’s continental crust every year along the subduction zones. Thanks Engineer-Poet, I have it now. I’ll just have to check whether Bernard Cohen’s figure has been supported elsewhere. Peter Lang questioned “30 TW for a billion years”. However my arithmetic does support that estimate. equivalent to 23 TW for 1 billion years. So the uranium coming down the rivers is not vanishing into the ocean, supporting your observation that it is being subducted. And presumably, joining the hydrothermal fluids that form granites that rise through the base of the continental crust. Perhaps we could claim it as “renewable”. Thank you for your calculation supporting the other estimates in the links provided in the two previous comments. Just one point: my comment about uranium being concentrated in the Earth’s Continental Crust is by differentiation as oceanic crust is turned into continental crust along the subduction zones. From what I recall from many decades ago, the oceanic crust is progressively being differentiated into a more sialic upper continental crust (i.e granitic types rocks) and a maffic (basaltic) lower continental crust below. The differentiation occurs mainly along subduction zones. The amount concentrated each year in the upper continental crust can be calculated from the total length of subduction zones, multiplied by the average thickness of the upper continental crust multiplied by the rate of progress of the subduction zones (e.g. 25 mm per year as an average). One of the pathways of uranium removal from oceans is co-deposition with phosphate rock. Phosphate mines are a good source of uranium as a co-product. I’ve made my own estimate of the GW-years of electricity that could be generated from uranium in the Upper Continental Crust, assuming 0.1% can be extracted eventually (this may be optimistic). I have not included uranium in sea water. My estimate is 6.75 million TW-years of electricity by using the uranium in FNRs.